Can digital technology solve the bust/boom cycle for the oil sands sector? Owner-operators in the oil and gas sector in Western Canada must feel they are navigating in unfamiliar, and even hostile, waters. The economics of production have been overturned in recent years, and chances are they will never be the same. If current economics become the norm, those same owner-operators will face the very real challenge of losing future investments if investors feel they can achieve better returns in other global regions. And the industry does recognize there has to be change, says Hakimattar. And it’s not that other countries are necessarily more advanced than the oil sands regions, Hakimattar points out, but that they have distinct advantages of low cost production compared to Alberta. So, how will the operator of the future approach these challenges? Hakimattar and his colleagues at ReVisionz believe it means applying many of the newer technologies, such as: Digital Twin, advanced analytics, artificial intelligence, smart sensors, augmented reality, automation and robotic process automation to enable new ways of doing things. And while, companies have been digitalizing over the last three decades with process automation, enterprise resource planning and document management, what is changing today is the advent of the cloud technologies and the Internet of Things, together with technologies such as artificial intelligence, and advanced analytics to predict the next equipment failure, smart assets that broadcast their locations, operating state and condition. The Operator of the Future and Digital Twin will see the convergence of Information Technology (IT), Operating Technology (OT), and Engineering Technology (ET) integrating people, processes, data, and technology. The use of technologies such as the Digital Twin to access all asset data from within a 3D model rather than having to go to five to 10 different systems to view it, will be new to the industry. 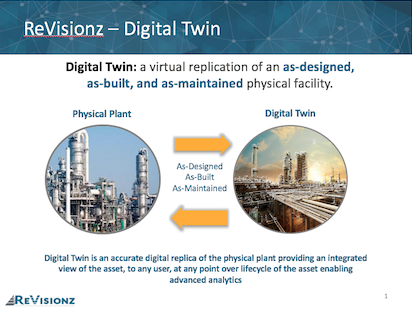 What is the “Digital Twin?” According to Hakimattar, Digital Twin is a virtual replication of an as-planned, as-built, and as-maintained physical product. It contains all the information generated to design, procure and construct the asset as well as performance data, maintenance history and costs, and equipment information such as model number, part number, spare parts, safety limits and manuals and procedures. Significantly, Hakimattar stresses, the Digital Twin technology model is a transformational concept. The roadmap on that journey begins with the decision of where to begin the transformation. Does the company look at the facilities, at the supply chain or should it consider automating its processes in finances? Should the operators go with more clones or use robots for inspections or should they go with the Digital Twin? At this stage, the funds are likely still limited so prioritization is key. Kelly Kinghorn, who leads ReVisionz’s Owner Design Tool/Engineering Information Hosting Practice, explains that ReVisionz works with owners to define, deliver and implement Engineering and Asset Information Management (AIM) programs. “Our vision is to lead our clients in their transformational journey towards digital twins of their physical assets to significantly improve safety, increase production, and lower operating costs,” says Kinghorn. “ReVisionz has a proven methodology providing consulting to owners, understanding their current state of AIM maturity, then working with stakeholders to define an AIM strategy, roadmap, business case and execution plan to achieve their desired state of Operational Excellence,” she continues, adding achieving a digital twin looks holistically at standards, processes, people/culture, content, and technology. Do you know the top 10 OSHA citations?